Whether you travel occasionally or live in a recreational vehicle full time, the weather is your constant companion, dictating many of your activities. I suppose you could say that non-travelers have a slight advantage, since the weatherman is probably talking about their specific location, and if he is wrong, most of their activities take place indoors. But as travelers, we have more fun. While one-day weather forecasts for a specific location are around 75% accurate, as you move around the country it would be nice to improve on that number. You can, by being observant and by understanding more about this subject we talk about so much. 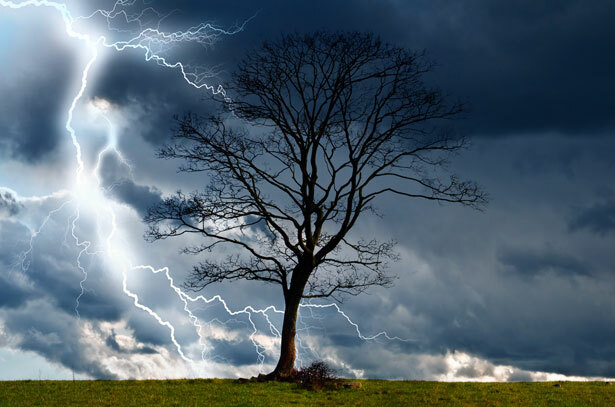 A closer look at this phenomenon and an examination of a few of the more accurate weather sayings will help you become your own weather forecaster. First, the bad news for those that can only travel on weekends – in some parts of the country it really does rain more often on the days you don’t have to work. Dr. David M. Schultz of the National Severe Storms Laboratory in Norman, Oklahoma researched the subject. And the good news is … no matter where you live, on the road you can often have a good idea of what to expect. By preparing for the weather that actually occurs, there is always something to do as you explore the world around you. During our years of fulltime travel we towed a red Volkswagen bus behind our motorhome. On top of the bus was a red canoe (yes that was us you saw) that we paddled all over the country. And we could see that canoe through the window before we even got out of bed in the morning. It became one of our important weather indicators during the summer. For us, “Dew on the Canoe” meant it was a day for outdoor activities, and weekend or not, it was usually right. For dew to form it has to be cold enough for the temperature to drop to the dew point. In the summer this tends to happen only on nights with no clouds to hold in the warmer air. No clouds should equal better weather. Unless it’s windy. With breezes overnight, there is a higher likelihood of unsettled weather, and the moving air will evaporate whatever moisture tried to condense on our canoe. All we had to do was make sure the canoe wasn’t wet because it was raining. If you don’t tow a canoe, you can find the same information by looking at the grass. Wet grass on a summer morning tends to be accompanied by clear, dry weather. And if the grass isn’t wet, just look up. The cloud’s height can be your next weather indicator. Both dew and clouds are caused by the amount of moisture in the air, and clouds occur at different heights based on a combination of moisture and temperature. The less moisture in the air, the higher an air column must rise before the water content becomes visible as a cloud. You’ll also get higher clouds with a higher atmospheric pressure. Thus dry air and high pressure accompany fair weather. Would you believe you can predict weather by watching nearby cows as you drive? This works best in the northeast, but the saying is “Cow’s tails to the west – weather is best.” Cows, and probably other large animals that can’t get out of the weather, prefer to graze with their tails to the wind. If all of them are facing east, there is probably a breeze coming from the opposite direction, and in much of the country a west wind tends to bring good weather. When you spend a lot of time in the outdoors you can even smell weather changes, and the reason has to do with air pressure. Air pressure is just what it sounds like – air pressing down. High pressure, and good weather, presses down hard enough to keep some odors close to the ground where you won’t notice them. But low pressure that might occur before a storm releases the smells from swamps, ditches, and other low lying areas. You really can smell a storm brewing. In the same way you can often see differences in air pressure. Watch smoke from a chimney. If the smoke is falling instead of rising it may mark the end of good weather. Other creatures in the outdoors notice the difference too. If the birds are flying closer to the ground, a storm may be in the making. If all else fails, you can always buy a special weather hat. These come in all colors, and for the traveler they can truly help in planning your activities for the day. When you first get up in the morning, take your weather hat and toss it out the door of your rig. Fix a cup of coffee, and when you’re completely awake, check the weather hat for its prediction. If the hat is dry, plan for a day of hiking and outdoor exploring. If the hat is wet, find a good book. If the hat is white, you’ve probably waited too long this season – it’s time to move south with the rest of the snowbirds. If the hat has moved, the wind is blowing. Check the wind direction for further information. And if the hat is gone, the wind is really blowing hard. Maybe it’s time to get out your weather radio and see what the professionals have to say.